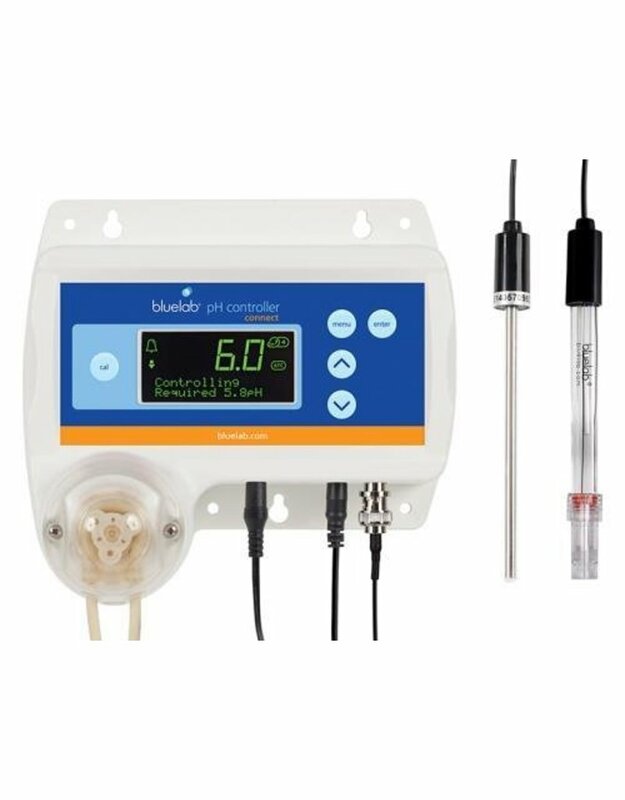 Our brainy pH Controller Connect constantly monitors and fine-tunes the pH levels for you. But more than that, it wirelessly data logs to your computer too, putting continuous information at your fingertips. Use the data to make system changes faster for the ultimate crop. You can also change the settings from your PC. One Bluelab Connect Stick is required, sold separately. Local and cloud data logging capability (download free Bluelab Connect Software). Option to view data and current status remotely via Google Docs™. For use with reservoirs up to 200 US gal/760 L. Plant-safe green backlit LCD with adjustable brightness and large, easy-to-read display. Easy to navigate menu to program, adjust settings and calibrate by a simple push of a button. Flashing high/low alarm with control lockouts to protect from over-dosing. Auto resume dosing on restart after power loss. Includes: water-resistant, wall mount housing, 13 ft acid/alkali resistant dosing tube, international power supply, replaceable double junction pH probe and temperature probe (for pH ATC). Use with undiluted Bluelab pH Up or Down. Compatible with Bluelab Connect Stick and Connect Range Extender. 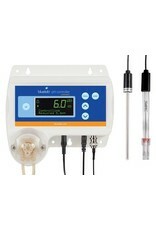 6 month guarantee for Bluelab pH Probe.